So I decided to make use of the bag of dried black-eyeds that Guru inspired me buy and recreated my own Black-eyed Peas and Aloo Sabji. 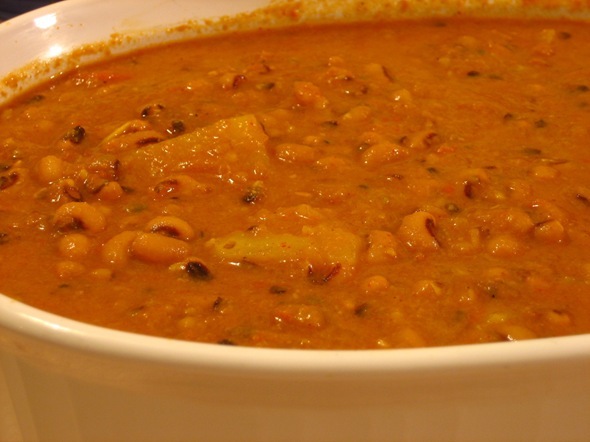 Black-eyed peas have a velvety, if even creamy, mild taste and soft texture. As if that’s not enough, they are loaded with, among other nutrients, protein, potassium and fiber. Soak and rinse black-eyed peas for at least 1 hour and then pressure cook (time will vary depending on the type of pressure cooker you have). Set aside. Finely chop garlic and onion pieces in food processor. Heat about 1 tbsp. of oil in a stockpot and then cook onions/garlic on medium heat until translucent. While the onions/garlic cook, puree the tomatoes in the food processor along with the green chilis. Add to the onions/garlic mixture. Continue cooking on medium until the water from the tomatoes starts to disappear. Add all of the masalas and the yogurt and continue cooking until the masala mixture has a thick consistency. Add ~3-4 cups of water, potato pieces and black-eyed peas. Cover and bring to a boil until potatoes are cooked (about 25-30 minutes). Using a flat wooden spoon, press some of the black-eyed peas and potatoes against the side of the stock pot to thicken the consistency of the sabji a little. Garnish with cilantro. Serve ladled over basmati rice or with rotis. I’m happy to bring a decent quantity of Guru for our coming event if you so choose. The photographs continue to look awesome, btw. WOW yum. This is by far the best Indian dish I’ve made so far! I added some fenugreek at the end, which turned out really nice. Thank you so much!